Four teenage girls from Whatcom County were hospitalized early Sunday morning after police say a drunk driver crossed the centerline and crashed head-on into their vehicle south of Everson. Police officials say 28-year-old Justin D. Beld was driving a 2004 Mazda RX8 southbound on Emerson Road just before 2 a.m. Sunday when he lost control of the vehicle and crossed the centerline before crashing head-on into a 2000 Volkswagen Jetta driven by 16-year-old Cadence Pen. The Jetta was totaled in the crash, while Pen and three passengers – identified as 16-year-old Jewel Carpenter, 16-year-old Darian Dunnet, and 17-year-old Autumn Johnson – suffered significant injuries in the crash and were taken to St. Joseph Hospital to be treated. Pen and Johnson were treated for minor injuries at St. Joseph and released Sunday, while Carpenter remained at the hospital and was listed in satisfactory condition by Monday morning, according to a hospital spokesperson. Dunnet suffered more extensive injuries and was transferred to Harborview Medical Center in Seattle, and she also had been upgraded to satisfactory condition by Monday. News reports indicated that one of the girls suffered a broken arm in the DUI accident, while other injuries reportedly included a concussion, collapsed lungs and contusions. It was unclear exactly which of the girls had suffered the injuries. Beld was also injured in the crash and had to be hospitalized to receive treatment for his injuries. He reportedly appeared at his court hearing in a wheelchair Monday afternoon. According to KIROTV.com, Beld has a history of criminal charges involving drugs and alcohol, including a DUI arrest in 2007. His bail was set at $25,000 and the judge said he may only drive a vehicle if it is equipped with an ignition interlock device that won’t start if he is under the influence of alcohol. If you'd like to have a free consultation with an attorney after your car accident, contact Davis Law Group. interesting that you have this case posted. are you representing anyone from this crash or does it seem that they will be needing representation? 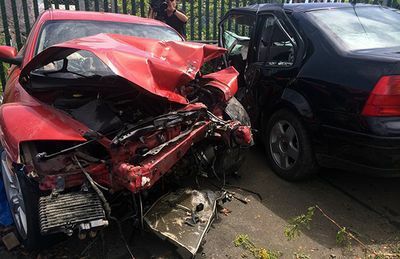 i am a parent of one of the victims of the crash, looking for advice on how to proceed.